Friday evenings at our house have long been designated the ‘snacks for dinner’ evenings. When the children were little, they called it Family time Fridays….yes no surprise there…. our family always bonds over food 🙂 With the wide array of mouth watering, tantalizing and tempting snacks from around the world to choose from, making the snacks our main course made sense. Just in India alone, the different states have their own special tea time and tiffin snacks, and the aroma drifting from the street food carts tempt your taste buds at every city corner. 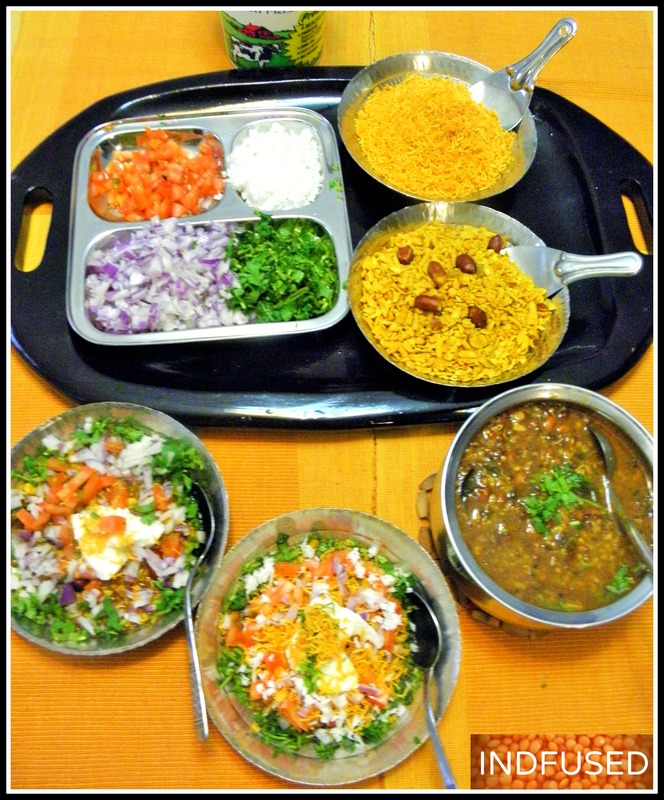 One such dish is the Misal in the state of Maharashtra. The word Misal literally means mixture. 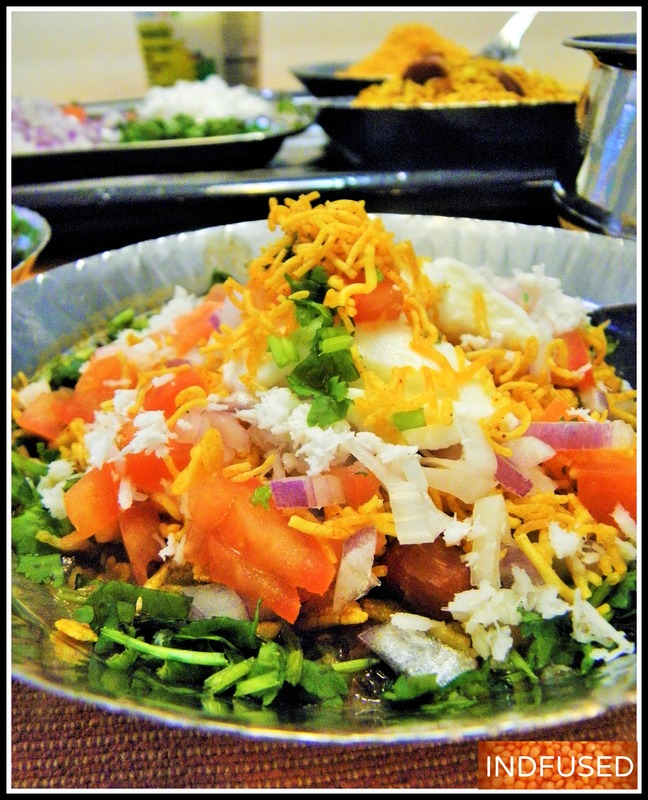 There are many versions of Misal, like the super hot and spicy Kolhapuri Misal paav and the milder Puneri Misal well known for adding pohe, a pressed rice snack to it. No matter which version you make, it is a great party dish where guests can help themselves to the toppings. On the plus side, I got the children and my husband to eat sprouted pulses which they normally refrain from! A variety of dried pulses like Moath/matki, black eye peas, white peas etc.. are soaked and sprouted for Misal. The goodness of the sprouted pulses justifies the fried chivda and sev, I believe! sev, chivda both store bought, peeled and diced red onion and boiled potatoes (optional), diced tomatoes, minced cilantro leaves, grated coconut and plain yogurt. Heat the oil in a pan over medium heat. ( I used a pressure pan). Add the next 11 ingredients in the order given.. Add the water and cook until the pulses are softly cooked. On my electric cooktop,the pressure pan cooker timing is one whistle plus 5 minutes on low. After opening the lid, add the next 5 ingredients, let the Misal simmer for 4 to 5 minutes. Enjoy the weekend. I am taking the Misal and joining the Fiesta at Angie’s hosted by Ginger of Ginger & Bread and Loretta at Safari Of The Mind. Thank you! Do let me know how you like it! Welcome Sandhya, better late than never :). Your dishes are just so vibrant and colorful, love all the explanations too. I like the idea of Family Fridays, I’m sure those warm memories will live in your hearts forever. So tell me, what’s the difference between hing and kasuri methi? I’m always confused. A great variation of pulses. Hi Loretta, Always a pleasure to hear from you! Hing is the asafetida powder which is stinky- may be that is the one you were thinking of? (aha moment here! 🙂 Hing is a natural gum, yellowish in color, that is powdered. It is used very scantily- like 1/ 16 to1/8 teaspoon. kasuri methi is dried methi (fengreek) leaves, so dark green in color. Anyway, Family Fridays were really enjoyed by the children when they were little.In fact, this Mother’s Day I will ‘demand’ (hey I am Queen that day:) that they write to me about one of their favorite Family Friday. I remember one wintry Friday, we had a picnic by the fireplace and the kids got to choose their own toppings on the personal pizzas I was making. We had some crazy topping combinations! I have an ‘aha’ moment when you asked about the difference between kasuri methi and hing. Hing is the stinky one you were talking about I think. Hing/asafetida is a natural gum, yellowish in color. I use between 1/16 to 1/8 teaspoon in a recipe- it adds flavor and also helps with digestion. Kasuri methi is the dried and crushed leaves of the fenugreek plant. So dark green in color.. Methi seeds are mustard brown color- again I use 3 to 4 grains. Thank you Judi! Your class sounds like fun! How many different curries did you learn? You are so talented that I am sure you will excel at curries too. Wish I had all these ingredients. It looks incredible! All of them are available in most Indian stores, if you have any close by. Thank you Antonia! You are so kind. This is so colorful and delicious looking. I would enjoy this since I love vegetables and different new foods, too. oh and p.s. congrats on your mention this week. It was well deserved :). I’m sure you must be mighty proud. I am so happy and proud!!!!!! Thank you! This looks absolutely yumm! Thanks for sharing it!!! Misal is all time favorite. Good recipe!